Before I get to the film I’d just like to share my amusement at being justified so soon after my review of Kim Newman’s Video Dungeon book of B-Movie critiques. In said review I describe Newman’s collection of pieces as coming across rather dry and I would much rather watch him enthuse about his subject on camera. And here he is on the extras for this disc doing exactly that. Very entertaining it is too. As for the film itself – all 129 minutes of it: you wouldn’t think it would work putting together an established actor such as James Mason with a crooner like Pat Boone. But work it does. Boone even gets his solo song piece when his character woos his love-interest on the piano prior to the journey. Jules Verne stories are grand fantastical adventures on a wide landscape. They are more about what happens along the way than the achievement of completing them. Transferred to cinema that means the spectacle is the meat and gravy, as opposed to any outcome. So we have a number of set pieces. The number of scenes with monsters is reduced from the book to only a couple of moments wherein iguana-type lizards run around with fins strapped to their backs. The journey itself is a gentlemanly Victorian – almost Cyberpunk romp, with brass wind-up lamps and cumbersome breathing apparatus. The comedy element is supposed to come with the presence of the duck, but thankfully it isn’t played for slapstick silliness. Ironically, the most horrific moment of the film comes with the off-screen demise of said duck. That dastardly villain quickly gets his comeuppance though. This release brings a new 4K restoration, 5.1 sound, an isolated soundtrack, the aforementioned Kim Newman interview, a commentary by actress Diane Baker and film historians Steven C. Smith and Nick Redman, and a restoration featurette. 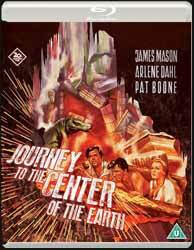 Journey to the Center (Centre to us Brits) of the Earth doesn’t create excitement to put you on the edge of your seat, but it remains an enjoyable experience.